Traveling is one of life’s greatest joys; pair that with the natural curiosity of a toddler and you have the recipe for a potentially fantastic adventure! However, while sharing the traveling experience with your child can certainly add to the thrill of the journey, it can also be stressful. Investing just a bit of time to make certain that your vacation accommodations will be safe for your child helps to ensure as restful, relaxing, and enjoyable a vacation as possible. It can be a real challenge to be removed from the controlled environment of a home living space. Hotel rooms, cruise ship cabins, rental properties, and even family member’s homes often lack the basic child-proofing measures to which parents have become accustomed in their own homes. Moreover, because cleaning standards vary from place to place, there is no guarantee that objects or surfaces that the guests preceding you may have handled were properly disinfected, which could result in you or your children catching someone else’s cold, or worse. 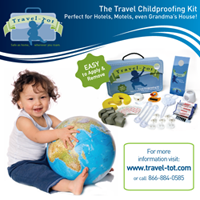 You can easily provide a basic level of protection from many of these hazards in just minute’s time with a few simple items (like those conveniently provided in the Travel-Tot Childproofing Kit!) including; outlet covers, doorknob protectors, cord guards, door pinch guards, a bath thermometer, and safety latches. The bottom line is that when you are traveling with a toddler, a little planning goes a long way; it could be the difference between an enjoyable vacation and a travel nightmare. Get down on your hands and knees and explore the room from your toddler’s perspective; be sure to thoroughly check under beds and furniture for stray pills, buttons, pins, or other items that could pose a poisoning or choking hazard. Use guards to tie up electrical and blind cords which can pose a choking hazard to your little explorer. Secure low cabinet doors shut with pinch guards to reduce risk of injury. Ensure that all locks and latches on exterior doors are in working order and secure them to prevent unsupervised access to stairs, balconies, and terraces. If your little traveler is curious about the toilet, be sure to place a doorknob protector on the handle to prevent unsupervised access. Sanitize surfaces, door handles, faucets, remotes, phone handsets, light switches, and any other object from which your toddler could potentially contract germs with disinfecting wipes. Check water temperatures before you give your child a bath; the water may be hotter than what you are accustomed to at home and could pose a burn hazard. If your toddler is a restless sleeper or is new to sleeping in a “big bed,” you may want to pack a portable guard-rail, or move the bed against a wall and use a chair along the open side to prevent a fall. Finally, be sure to arrange the furniture in a way that allows for some play space; a room full of “no-nos” will result in a bored and irritated toddler, which will lead to a stressed and anxious parent! Out and About: Separation Anxiety!